In this post we will try to define and illustrate the importance of using influencers in your marketing campaigns in order to guarantee success. But before we do that, let’s make sure we all share a common understanding regarding the general goals and objectives of marketing campaigns. helping you establish your company in local search engines. All of the goals and objectives, however, in marketing campaigns need to be “SMART” . In the marketing world, as you all know, “SMART” stands for specific, measurable, attainable, realistic and time-scaled objectives. But, Why Do I Need an Influencer to Achieve these Goals? Well, according to a report from Nielsen, a global information and measurement company, 83% of the consumers say that they trust the recommendations of their friends and family. This type pf advertising is also known as “earned media” and it sets the foundations for influencer marketing. They Are Trustworthy. They only use original content-their content and thus, people trust their information and thoughts. They Are a Thought Leader. They are focused in one topic, with a specific audience that follows them and with which they interact on a regular basis. Their Words Have Impact. Their knowledge and expertise have the power to affect people’s decision making. They Are Engaging. Engaging with their readers is a priority to them. Readers appreciate that and as a result, they expand their trust and love. They Go To Their Audience. They use the the same platforms with their audience. They make sure their voices are being “heard” by the people who they want to be heard from. All of the features that we mentioned above will be more than valuable in your marketing campaigns. With the help of influencers, your “SMART” objectives and goals will be accomplished before you know it!! How Am I Going to Use An Influencer? Now that you understood why it’s important and helpful to use influencers for your marketing campaigns; we can move to the next step, and give you some tips on how to use these influencers. The first and most important tip we have to give you is: Find the right fit for you, your brand and most importantly your product! Secondly, use his audience!! a)Request from your influencer to write about your brand on his blog. b) Ask him/her to tweet for you once a week and c) ask your influencer to post once a week on Instagram and Facebook, content that promotes your company. Last but not least, become active in his/hers community. When your influencer is not posting for you, do it by yourself. Comment and share his content in order to make your brand visible and recognizable. Marketing campaigns are essential for every business, big or small. 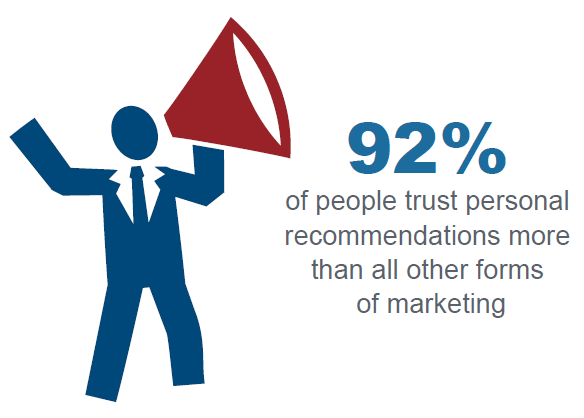 Statistics show that word to word advertising is what people prefer and trust. Influencers are people with authority, who affect the decision making of consumers and certainly have their trust. As a result, influncers are the people you need in your marketing campaign to ensure positive results. Find the right person, take advantage of his audience and influence, and get ready to take your company to different levels!! Success is inspiring! While there are certain things that are always in the forefront of our minds, sometimes we forget the greats. Here is a reminder of a few influential campaigns over the past few years that should be an inspiration (or challenge) for others! The below three success stories all took different approaches and achieved their goals. They knew how to target their audience, execute their message and drive results. Solution: Instead of taking the traditional route of just marking the product down and getting rid of it, Tyson focused their efforts around two ideas: creativity and influencers. Tyson started created in store demos around their central message “Why Should Cookies Have All The Fun?” They modeled their demos around cookie decorating, switching out the cookies for nuggets and decorations for condiments. Tyson encouraged everyone who participated to share their experience. They asked mommy bloggers Wendy Wright from Choosing Love, Shannon Gosney from The Mommy Files, and Mellisa Swigart from Mom Luck to participate in in-store demos. Why It Worked: Tyson understood their demographic and appealing to families was crucial to their success. They were engaging and accessible and created a clear call to action. Tyson’s choice of influencer was also key in driving their success. The community around Mommy Bloggers is large and relies on these influencers as trusted sources of information. By tapping into their larger network, Tyson was able to generate success. Solution: They reached out to Hines Ward of the Pittsburgh Steelers. They created a campaign around “My After” following the athlete through workouts, sports dieticians and at sports medicine conferences. The goal was to educate on the science behind chocolate milk. Weber Shandwick understood that there is a lot of influence in this industry peer to per and word of mouth and utilized that activity. They also provided this network with resources to become knowledge experts in this subject area. Why It Worked: This campaign really highlighted the benefits and value of the product. Traditional “Got Milk” ads focus on engaging with the current customer base, while this campaign focused on growing and expanding their reach. By going through the athletic network, it taps into a network that is naturally excited by health, fitness and well-being. This influencer partnership on this endeavor would be seen as a perfect match between the product, the influencer and the end user. Solution: Birchbox paired with lifestyle blogger Emily Schuman of Cupcakes and Cashmere. They collaborated on the May Box and promoted their partnership across both Instagram accounts; Birchbox has 469,000+ followers and Emily Schuman has 260,000+ followers. They shared exactly 5 Instagram photos to promote this partnership in what they call an Instagram takeover. Results: The Instagram takeover was successful with the five photos reaching more than 550,000 customers and accumulating over 18,000 likes. Why It Worked: This was not the first time Birchbox has done an Instagram takeover. Back on Mother’s Day 2014, They had a very successful experience with Christina Zilber. That campaign generated 1,135 user-generated posts and high levels of engagement. These tactics are working for Birchbox because they understand their audience. In beauty and fashion, people typically do not try new products until someone reputable stands behind them. By creating strong partnerships, they are creating a link between the two communities. By doing them for a short period of time it is creating exclusivity of, for example, the May Box products. All three companies took slightly different approaches to their influencer strategy. As long as you understand the foundation of your business, the mission of your influencer and the target audience, you should have a successful campaign just like them! Is your brand having trouble getting noticed online? There’s no denying that online branding has become increasingly challenging as consumers have become less trusting of any marketing content posted across social media channels. It used to be that consumers wanted to interact with brands after viewing advertisements they actually enjoyed. Nowadays, consumers don’t even want to communicate with companies anymore. Instead, they want to communicate with real people with strong personalities. Social media’s constant influx of content is a problem most brands have to sift through in order to reach a target audience authentically. The surefire way to build your brand online is through trust. For example, Nike conducted a study and found that less than 25% of consumers trust advertisements online. Thus, its evident that the level of success of a brand’s marketing campaign online is centered on its ability to build trust. While the advertising industry, overall, has been slow to adapt to the changing media landscape, newer opportunities are available for brands to influence their consumers. Welcome, influencer marketing. Influencers are a great way to connect your audience to the ever-changing media channels. Yet, it’s important to utilise the most relevant influencer specific to your brand and audience in order to produce high-quality content that resonates amongst your followers. Marketing content cannot reach its intended audience, no matter how creative, without trust, which is why influencer marketing remains a powerful tool for marketers. Influencers are essentially relationship-builders. They genuinely combine brand messages into their personal narratives which effectively leads to building consumer trust. Why do you need a brand influencer? It’s fair to state that most brands face an uphill battle in the digital world. A report from The Guardian saw that 69% of customers use the Internet as their main source of information. Influencer marketing is powerful because your brand has access to a tailored audience. When carried out appropriately, marketing content appears more genuine and authentic. So, it’s time to move away from the banner ads and move towards implementing a strong influencer for your brand. A study conduct by McKinsey discovered that online word-of-mouth advertising produces twice the number of sales than paid advertising, while also leading to a 37% higher retention rate. The optimal way to drive sales is to clearly identify influencers in your specific industry and leverage their voices to promote and communicate your brand’s message. Influencer marketing does not only increase brand awareness, but also your brand’s true value. In addition, personalised campaigns can grow your follower base and increase overall engagement with your audience. When there’s an increase in consumer activity on social media, your brand grows. Consumers want to be reached with marketing content at the right time with relevant and applicable messages. Thus, trustworthy influencers can reach this audience and generate genuine engagement that could possibly go viral on the Internet. Moreover, they can also generate customer acquisition and nurture new leads. We all do it. We’re all influenced by other people’s opinions and actions. But it’s important to note that we tend to admire people who we trust. More than 81% of consumers begin their buying journey online and 70% trust and follow the recommendations posted by others. So, start implementing influencers for your brand today! The authentic messages they create and share on behalf of your brand will only result in a surge of consumer behaviour and an overall increase in your brand equity. Since consumers are less trusting of marketing content online, branding has become increasingly challenging. Consequently, brands have to work carefully to build the trust needed for their target audience. If your brand takes the time needed to identify a specific influencer to highlight your brand to their audience, then earning that trust is relatively easy. Does your brand currently work with influencers? Has it worked for your brand and built trust amongst your consumers? Let us know in the comment section below!